Canadian Hard of Hearing Association-BC Chapter offers a Hospital Kit which we hope will make any hospital stay less stressful for the Deaf or Hard of Hearing patient. We also hope it will serve to educate the hospital staff and visitors about the special communication needs of the patient with hearing loss. 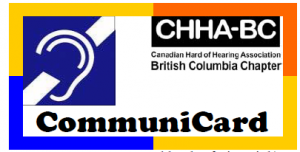 Canadian Hard of Hearing Association-BC Chapter information. INTERNATIONAL SYMBOL CARD: To be placed on the wall over the bed or on the door. Use the Hard of Hearing side or the Deaf side, attach with poster strips supplied. Please read poster strips instructions first. SMALL HEARING LOSS STICKERS: To be placed on charts, patient wrist bands, and the intercom button at the nurse’s station as a reminder that you cannot understand or hear if they speak to you over the intercom. PEN AND PAPER: If needed for writing messages. BLUE EAR PIN: International symbol. It can be pinned on the hospital gown or pillow. COMMUNICARD: Show/display to physicians, staff and others (Dimensions: 4 x 2). SPECIAL COMMUNICATION NEEDS CARDS: Communication tips and further information to give to staff. Please tick appropriate items and indicate if you need your glasses to speech read. SMALL PLASTIC BAG: For hearing aid/CI processor storage, as well as information for use. A safety pin is supplied, please complete the label with your name and room number. PICTORIAL/SYMBOL CARD: To be used to indicate patient needs and concerns through the use of pictures and symbols. It is always a great idea to be prepared with a few things that will help hospital staff remember you are hard of hearing, and have instructions on how they can meet your unique communications needs.